Regina Spektor segues back to the refrain of Small Town Moon with six consecutive baby-babys. That’s twelve babys, in about five seconds. It’s a hilarious and almost startling way to kick off her latest album, What We Saw From The Cheap Seats, which comes out May 29th. But it’s also a typical moment for Spektor – the kind of moment that’s come to define both her songs and her critics. 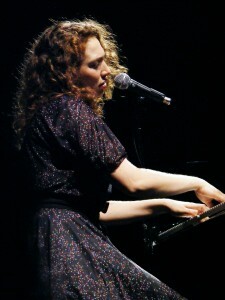 “Regina Spektor has been dogged by the q-word – ‘quirky’ – since she first started to attract national attention,” the AV Club’s Keith Phipps wrote after the release of her last album, Far. Expect to see plenty of the q-word in the coming weeks as Cheap Seats rolls out online: Spektor leaps from the 12 babys in the album’s first track, Small Town Moon, to mouth percussion in Oh Marcello! to a series of blackout inducing gasps in Open. And expect to see plenty of controversy as music critics continue to wrestle with this aspect of Spektor’s work. The standard template for Regina Spektor music reviews emerged as early as 2004 with the release of her breakthrough album Soviet Kitsch. Acknowledge the obvious: Spektor is an enormously gifted artist. Walk through her almost absurdly romantic biography: born to a family of Russian Jewish musicians, she was trained as a classical pianist in Moscow before moving to the Bronx. Check off the eclectic list of influences and allusions that saturate her work: Mozart, Chopin, The Beatles. After three rounds of Cheap Seats, it may seem like Idov has a point. For instance, Spektor creates a jubilant climax for The Party by switching out the third chorus lyrics with a full-hearted mouth trumpet vamp. It’s an exhilarating surprise the first time; the second time you’re ready for it, like a surprise party you found out about before you opened the door. But does this ruin The Party? Ask anyone who remembers when Spektor pulled the same trick in one of her most enduring tracks, Somedays, almost eight years ago. There, the mouth trumpet is if anything even more out of place – a silly counterpoint to song’s earnest sentiment and simple orchestration. But years later, it no longer feels like a gimmick; it’s an indispensable part of the song that throws everything else into dramatic, powerful contrast. Spektor is always playing with music, and many of her gimmicks are more sophisticated than they first appear. She delivers Small Town Moon‘s baby-baby sequence like one of those “totally spontaneous” moments Idov has in mind, but consider how she sets it up: with a driving hook that layers a clockwork lyric (“Thought you ought to know by now / Everybody’s not so nice”) over a syncopated 4/4 rhythm. The bridge is so mechanical that it telegraphs exactly where it’s going to go; the baby-babys are a sudden break with a predictability that she’s been building for much of the song. Not all of these experiments go as planned. Please Don’t Leave Me (Ne Quitte Pas) originally appeared on Spektor’s second album, Songs, with just the artist and her piano; it returns on Cheap Seats reinterpreted with a distinct reggae rhythm and a horn section. The earlier version is light-hearted and, at worst, forgettable; the new version’s orchestration is confused in mood, cramming melancholy lyrics into an incongruously buoyant sound. But the album’s worst moment comes when she takes no risks at all: the painfully by-the-numbers, seemingly endless How. Think of that song playing faintly in the background during the slow dance scene near the end of an ’80s romantic comedy – the one that you forget is even playing until they crank up the volume during a lull in the dialogue. Now think of the same thing, but with no movie and no dialogue: just the same song plodding to an unobtrusive climax and then fading into the background of whatever it is you’d rather be doing. It’s quirky the first time, but after three listens one can’t imagine Firewood without it.